They're quite dark I agree, but I don't know if it's possible to bring some lightning with MilkShape 3D so if someone knows how to correct this, it would be much appreciated. However, the main reason of the thread is to learn how to combine mounted units. I didn't try yet, but I suspect some subtleties so advice and tips are more than welcome! One last thing, I've a problem with archer units: the middle of the bowtring remains in the initial position when I move the joints. Does anyone have an idea regarding this issue? They look pretty good. Just beware of this particular task - the last person who set themselves the job of overhauling them burned himself out. I don't know much about the mechanics of doing it, but Genghis Skhan and Kull have done a lot with it recently. PS: I will correct the position of the arm of the Libyan Swordsman so it matches the one of the Caetrati. I realize it's a pretty tedious task, but fortunately, if I have no artistic talent whatsoever, I'm very resilient at repetitive tasks so it should be fine. Do you mean they're working on new unit cards currently? Are you planning to do a full set of cards for each faction? Or just one card per unit (based on the most likely faction or something)? It's the sheer volume required to do every combination of unit and faction that was the killer when someone attempted it last time. No one is working on new cards right now, besides getting something in place for the new units. In the end, I'd like to make a full set of cards by faction, but I'll start by replacing all the current ones. I'm already saving several versions of each unit I make. I'd also like to have one colour code by faction to emphasize the difference between them, but I don't know if the variety textures will allow it. 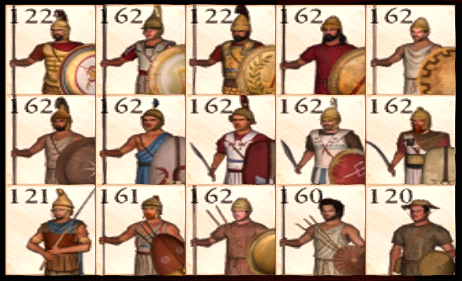 Added some thureos and thracian units to KH. Note that the picture doesn't reflect my actual progression because there are lots of combinations for other factions that aren't shown here. However, I'm still struggling with archer units and mounted ones. These unit cards are beautiful. I really like the uniformity in stance. I couldn't find a good pose for the phalangitai (the sarissa messes with the view) that's why they're not here. Last edited by MagusCaligula; March 21, 2018 at 06:10 PM. Another obsessed for uniformity ( toon sizes, positions, etc) here. You got a pretty dam good job there mister. Keep them comming. 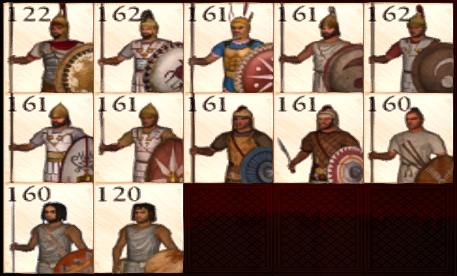 Quintus if were you ( one EB Team member) i would prolly be baiting him to finish the work and add him to Team, or at least to ask him permission to add as many cards as he wants to do to next release. PD: Umhh just a detail... could you please move the number of amount of mens a little bit so the 1xx of the hundred isnt on the spear handle? Last edited by melvidh; March 24, 2018 at 02:28 PM. Actually, the "1" is somehow a marker for me. Besides, if I move the spear to the left, it will be weirdly too close to the border and if I move it to the right, I'm afraid there won't be much of the shields to see anymore. I could change the position of the arm but I'd need to find new markers then. However, if other people feel like you, I could make the effort. Hot. I prefer the first option. Looks more "Seleucid". Amazing work! I really like your UI cards.